Manipur police department continues to assist the state Excise department in seizing the destroying the illegal selling of liquor, drugs and psychotropic substance in Manipur. 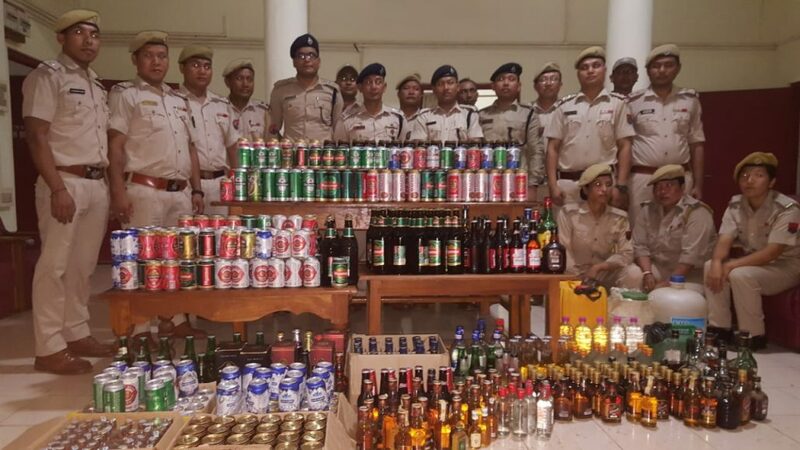 On Tuesday, state police stationed at Moreh, a border town located about 110 km south of Imphal under the supervision of the Tengnoupal district SP Dr S Ibomcha conducted a drive against liquor and seized a large quantity of liquor and beers valued around Rs 61,490. Additional SP Tengnoupal Kh Robinsun Singh, Sub-Divisional Police Officer Moreh Sandip Gopaldas Mohurle, Deputy SP Commandoes Moreh Thomas Thokchom, Officer in Charge Moreh L Vaiphei and In Charge Commandoes Moreh Y Shaktisen also accompanied the SP Tengnoupal while conducting the drive in the border commercial town. The seized items were later handed over to Excise Department for necessary steps, police sources from Moreh said. It may be mentioned that the Excise Department is functioning with the help of 315 staffs out of 704 sanctioned posts by utilizing only two vehicles that also in dilapidated condition. The department has three circles such as Imphal, Thoubal and Bishnupur districts. Under these circles, there are 39 excise stations spreading all over Manipur with one officer in-charge. At present under the Commissioner of Excise, there are one superintendent and four deputy superintendents to assist the commissioner in the enforcement of prohibition and administrative works. Official sources said the total amount of money that collected through 2893 confiscated and destroyed cases in the year 2017-2018 was Rs 38,33,700. Manipur became a dry state after the government passed the Manipur Liquor Prohibition Act in 1991.